The January 8th Meeting was called to order at 7:00pm in Rosalie Rendu Room at O’Connor Hospital by Crystal. Nineteen people were in attendance including 3 newcomers. Collin from Stealthbelt.com came to make a presentation about his product which has been highly endorsed by members of our group. He began his presentation by telling us his journey to becoming an ostomate. Collin was a competitive long distance runner in high school and university. In his junior year of college he developed ulcerative colitis and had to take time off training and school to regain his health. Since his whole identity was wrapped up in being an athlete he suffered an emotional crisis besides working to regain his physical health. One of his professors told him, “only challenge produces the opportunity for greatness” which inspired Collin to overcome any obstacles and begin training again. He finished college and began working for Stealthbelt, a product he believes in. We at the meeting can attest that his work and his story are an inspiration to others. A few things we learnt from Collin at the meeting. We all want to prevent getting a hernia or making our hernias worse. To prevent a hernia, the tighter the belt the better and core strengthening is important. Collin advocates learning the proper mechanics of movement and to find a physical therapist who specializes in functional movement. When first working on getting your strength back after surgery look up youtube videos on postnatal exercises for women who have had C sections. After Collin’s presentation we asked our new folk if they have any questions we can help them with. Good luck to Michelle who undergoes surgery on Thursday. Crystal asked for volunteers for panel speakers for an ostomy nurse class at San Jose State University. Eddy, Rich and Virginia volunteered. After our meeting we received an email letting us know that long time group member Linda Sloan, who worked to cope with a short gut ileostomy, passed away. We will inform the group of the date of her memorial service when we hear of it. It will be in the spring or later. The December meeting was called by to order at 7:12 pm in the Rosalie Rendu Room by Crystal, we started a bit late due to organizing efforts for the Christmas Social. 17 people were in attendance for the meeting. We had a short Round Robin introducing each member of our group. This has become a key part of each meeting as we understand what our members are facing and how they deal with some of the issues involved. Crystal then began the evenings activities. People bought tickets and placed their tickets into bags in front of the items they were interested in. Crystal then with help began to draw tickets and we presented the winner with the item. A lot of fun was had by all. A fair amount of money was raised that will help with some of the expenses incurred by our group. A Special Thank you goes out to the members who simply made a donation to help out. Bag it Away.com sent samples of their Ostaway x-Bag, an Ostomy Disposal Bab bags that were handed out, a special Thank you goes out to Eddie for sending us those samples. Stealth Belt sent us a belt and it was raffled off. Eddy was the lucky winner! Thank you to Stealth Belt. Speaking of fun. Several people have asked that we have a “Social Night” at a local adult beverage facility. We took a vote and we will be scheduling a “Ostomy Night Out in the Near Future.” The consensus was a Tuesday evening starting at 5:30PM. If anyone has a suggestion for a location, please let me know! Crystal wants Santana Row. Looking for suggestions here! A number of people raised their hands wanting this to happen. Can we have a volunteer to chair this event? If you take a look at our Web Site, www.svosg.org, you will see a lot of information about Ostomies and our upcoming schedule. We try to schedule speakers that can relate to people with Ostomies. We have had surgeon’s, Naturopath’s, Acupuncturists, Representative’s from various suppliers. The reason this is mentioned is to ask for your help in filling our schedule for next year. If you know someone that would speak to our group, about anything related to the world of an Ostomate, please let me know about it so I can try to schedule it. I am happy to announce that the Free Ostomy Clinic opened the afternoon of October 12th, 2018 at San Jose State University. They provide ostomy care to adults and children who cannot obtain this service elsewhere. Clinic hours ware from 1:30 pm to 7:00 pm on most Fridays, except school holidays and semester breaks. Clients will be seen by appointment only; clients may call the clinic appointment line at (408) 924-3422 to schedule an appointment. If a scheduler is not available to take the call, the client may leave a message and the call will be returned as soon as possible. We will issue parking passes to clients prior to or during the appointment. Please spread the word to those in need. Our next meeting is January 8, 2019 in the Rosalie Rendu Room, starting at 7:00 pm. The meeting was adjourned at 8:25 pm. The November meeting was called by to order at 7:01 pm in the Rosalie Rendu Room by Crystal. 22 people were in attendance for the meeting. First of all, we would like to welcome 4 new members to our group. Barbara, Libby, Mary and Patrick. Mary will be having her procedure towards the end of the month and we wish her good luck. We also have several of our officers a bit under the weather or about to undergo a procedure. Linda, Jennifer and Sharon, we miss you. Before we started the round robin, we talked about a Stealth Belt. Several members swear by them and talked about the advantages of wearing one. Stealth Belt sent us one and a stack of brochures that were handed out. If this has an interest for you, we will have a representative from Stealth Belt here at our January 8th meeting! Crystal then began the round robin for the evening, asking each member if they had ideas for meetings in 2019. A number of ideas were brought up. Bag it Away.com – 1-800-774-6097. Eddie is going to send some samples. 1-2-3 Disposal of Ostomy Bags, Pouches, Products & Supplies. December 11 – Year End Party – We have brought items ranging from blankets to bottles of wine; imagination is the important part here, and then we raffle them off. A bit of a fund raiser for our group and has been a lot of fun. Plus it is fun to watch Crystal put a lot of tickets on a lot of items! Our next meeting/Party is December 11, 2018 in the Rosalie Rendu Room, starting at 7:00 pm. The meeting was adjourned at 8:43 pm. The October meeting was called by to order at 7:00 pm in the Rosalie Rendu Room by Crystal. 23 people were in attendance for the meeting. October has become our “Bag Change Extravaganza” month. This event we started some 4 years ago and it has turned into an event that a lot of our members look forward to. The purpose of it was to be a learning event and that is what it has become. This evening Jennifer and Sue demonstrated how they change their ostomy. Vivian talked through how she changes her Urostomy. All three answered questions as they went. The group wants to extend a big thank you for their help in making this night very special! We welcomed Mary to our meeting tonight. We are glad you came to our meeting and we look forward to seeing you in the future. I want to Thank Linda for her baking skills and making sure that no one was hungry. We appreciate your efforts…. We will have several members of our group going to San Jose State, on October 21. They meet with the WOCN Nursing program to answer questions about ostomies. November 13 –UOAA Board Member and double ostomate Joe Vega will be will us for the November meeting! Joe is a Motivational speaker and this looks to be an interesting meeting. I am happy to announce that the Free Ostomy Clinic will be opening in the afternoon of October 12th, 2018 at San Jose State University. We will provide ostomy care to adults and children who cannot obtain this service elsewhere. Clinic hours will be from 1330 to 1900 on most Fridays, except school holidays and semester breaks. Clients will be seen by appointment only; clients may call the clinic appointment line at (408) 924-3422 to schedule an appointment. If a scheduler is not available to take the call, the client may leave a message and the call will be returned as soon as possible. We will issue parking passes to clients prior to or during the appointment. Please spread the word to those in need. Our next meeting is November 13, 2018 in the Rosalie Rendu Room, starting at 7:00 pm. The meeting was adjourned at 8:45pm. The September meeting was called by to order at 7:00 pm in the Rosalie Rendu Room by Crystal. 19 people were in attendance for the meeting. Crystal introduced Ms. Maria Sanchez-Chan, Account Manager for ByramHealth Care. Maria has just taken over the responsibility for the San Francisco Bay Area. Thanks to Ms. Paula Tucker for her help in arranging Maria to join us this evening. Maria explained to us what Byram HealthCare does. In our particular case, we are interested in the Ostomy products. Maria brought along their latest catalogs antiseptic hand sanitizers and pens. In the Byram Catalog, beginning on page 8, is a section called “Getting to know your Stoma”. Interesting reading for us all. She also explained that Byram is one of the few companies that will custom cut the ostomy skin barrier to a patient’s stoma size. They carry virtually every one and two-piece appliance and a wide variety of accessory items. Byram can be reached at 1-877-902-9726. Maria can be reached at 415-515-9561. We welcomed several new people to our group. Delores, Diane, Dorothy, David and Pam. We are glad you came to our meeting and we look forward to seeing you in the future. Our Treasurer, Annette had items to share with us that she found on Facebook. On Facebook, look for Ostomyland and Ostomyfamily. She said it is a wealth of information. Also, she found DermaPro Silicone Waterproof Tape – Safe n Simple. http://sns-medical.com/woundproducts/dermapro-silicone-waterproof-tape. October 9 – Bag Change Extravaganza, the will be the fourth year we have done this. We would like to have three people volunteer to change their device at the meeting. This has become a popular event as we all learn from it. Please give this some thought and volunteer. This group is like family and it takes all of us to make it work. All of the officers have done it, please help out! November 13 – Open for Suggestions – Possible meeting for Joe if he can make it! – Email sent to Joe, now we will wait and see. Our next meeting is October 9th, 2018 in the Rosalie Rendu Room, starting at 7:00 pm. The August meeting was called by to order at 7:00 pm in the Rosalie Rendu Room by Crystal. 19 people were in attendance for the meeting. Crystal informed the group, that our planned speaker, Mr. Joe Vega became ill and would not be joining us for the evening. We wish Joe the best. We welcomed several new people to our group. Margot, Louise, Doug and Sue. We are glad you came to our meeting and we look forward to seeing you in the future. Crystal began with introductions of the group. With several new people, we took time to get to know our guests. Doug came to our meeting to see what we do, on behalf of his daughter. We are hoping that we meet his daughter in the near future. We gave Doug some information on how to contact Laura Cox from Shield Health Care. Laura will be an excellent resource for his daughter. Laura has been an ostomate since 2011 and offers a fresh and candid approach on living with an ostomy. She talked about some of trials and tribulations she has experienced. Laura shared an interesting quote with us, “I am the master of my own Experience.” Certainly, food for thought. Margot came to us from San Mateo and Sue is from San Jose. Louise came with her daughter, Janice. We got some great questions from our new members. Eric is also from San Mateo and we are happy that he has joined with us. Questions came up on how to travel and any pitfalls one might experience. Some of our members have traveled extensively and shared some of the issues they came across. Crystal suggested that an ostomate should make certain they have sufficient supplies for their trip. In some cases, shipping them ahead, making certain you have everything you need. Also suggested was carrying some large zip loc bags in your car. Should you have the need and are stuck in traffic, you then have a solution. Also suggested were wet wipes, a very effective thing to have if you need it! October 9 – Bag Change Extravaganza, the will be the fourth year we have done this. We would like to have three people volunteer to change their device at the meeting. This has become a popular event as we all learn from it. Please give this some thought! November 13 – Open for Suggestions – Possible meeting for Joe if he can make it! December 11 – Year End Party – We have brought items ranging from blankets to bottles of wine; imagination is the important part here, and then we raffle them off. A bit of a fund raiser for our group and has been a lot of fun. If anyone has a suggestion for a location, please let me know! Crystal wants Santana Row. Looking for suggestions here! Our next meeting is September 11, 2018 in the Rosalie Rendu Room, starting at 7:00 pm. The meeting was adjourned at 8:30 pm. The July meeting was called by to order at 7:00 pm in the Rosalie Rendu Room by Jennifer. 25 people were in attendance for the meeting. Jennifer began the meeting with a welcome and questions for the group. She welcomed several new people to the group, Ligia, a WOCN, Chin-Yu, RN, Brenda, RN, Joan, Joanne, Hamid. We are glad you have joined us. Laura Cox, Ostomy Lifestyle Specialist at Shield HealthCare joined us along with Helynn Rueda, Territory Manager for Shield HealthCare. Laura and Helynn have been with us before and it is a meeting we look forward to. Laura has been an ostomate since 2011 and offers a fresh and candid approach on living with an ostomy. She talked about some of trials and tribulations she has experienced. Laura shared an interesting quote with us, “I am the master of my own Experience.” Certainly, food for thought. Helynn talked about what Shield can provide with supplies. She brought a number of copies of “Living well with an Ostomy”. This 38-page booklet begins with an Ostomy Overview, describes the various types of stomas, types of pouching systems, Diet and Hydration, traveling with an Ostomy, and a Glossary, you will find interesting. If you would like one of these booklets, please contact Helynn Rueda at 800.675.8840. As each member of our group has a unique story, Laura asked each member to talk about their experience. She listened intently as members talked about some of what they have experienced. Speaking of fun. Several people have asked that we have a “Social Night” at a local adult beverage facility. We took a vote and we will be scheduling a “Ostomy Night Out in the Near Future.” The consensus was a Tuesday evening starting at 5:30 PM. If anyone has a suggestion for a location, please let me know! Crystal wants Santana Row. Our next meeting is August 14, 2018 in the Rosalie Rendu Room, starting at 7:00 pm. The June meeting was called by to order at 7:00 pm in the Rosalie Rendu Room by Jennifer. 20 people were in attendance for themeeting. This evening, we were joined by Ms. Toni Daniels, Territory Manager, Ostomy Care for Coloplast. Coloplast was started 50 years ago in Denmark by a nurse whose sister needed Ostomy Care. Coloplast continues to develop ostomy products and is extremely helpful for the new ostomate. They have a starter kit to send out for someone who is new to becoming an Ostomate. Call Coloplast at 1-888-726-7872 and ask for it. See www.coloplast.us. Ms. Daniels brought a number of different Coloplast products to our meeting, explaining how they work and some of the research that went into developing the item. She answered questions from the group and then stayed to answer individual questions. We sincerely appreciate her time and expertise. We thank her for coming to our meeting. Crystal then opened the floor to introductions and our round robin routine to briefly explain why we are there. We welcomed Paul and Robin to our meeting. Paul is scheduled for a Urostomy in July. Also joining us this evening was Eric and Rita. Eric attends a support group in San Mateo and wanted to see how our meetings went. Rita has surgery on the horizon and we welcomed her to our group! Also joining us was Helynn Rueda, Regional Manager for Shield Health Care. Helynn brought a number of Product Catalogs. This catalog has ordering information, Glossary, Restroom Access Act – Ally’s Law, Ostomy Support Groups and Resources, Life Style Tips, which leads to our July meeting. On July 10, Helynn Rueda and Laura Cox will be joining us. Laura has been an Ostomate since 2011. She enjoys sharing insight and advice on living with an ostomy. In her role at Shield HealthCare, Laura provides customers, employees and referral partners with valuable tips and perspective from her own personal experience. Laura makes a difference as a blog host on Shield HealthCare’s online Ostomy Life Community. Producing online video content with tips, advice and how-to’s, offering in-person support at local conferences and trade shows. Answering consumer questions at asklaura@sheildhealthcare.com. Get the latest from Laura at www.shieldhealthcare.com/ostomylife. Laura has a favorite quote she uses, “This isn’t the life I anticipated, but IT’S A gift.” Join us July 10 and meet Helynn and Laura! November 13 – Open for Suggestions…..
here, and then we raffle them off. A bit of a fund raiser for our group and has been a lot of fun. If anyone has a suggestion for a location, please let me know! Crystal wants Santana Row. Our next meeting is July 10, 2018 in the Rosalie Rendu Room, starting at 7:00 pm. The May meeting was called by to order at 7:00 pm in the Rosalie Rendu Room by Crystal. 18 people were in attendance for the meeting. Virginia brought this idea to the meeting. She is going to try to get several samples for people to try. StomaCloak adsorbs odor molecules! This means instead of covering up ostomy bag odors, StomaCloak’s unique technology actively changes the odor molecule, removing the odor. Read more about StomaCloak’s Odor removing qualities. Your StomaCloak is the first defense against leaks. StomaCloak fits completely around your appliance bag with its envelope enclosure. If something happens to your appliance (such as a clip or spigot failure) you have time to get to the restroom before you have a mess on your clothes. Caring for the skin around the area of your ostomy is extremely important for long-term health. An antimicrobial inside the StomaCloak is specifically designed to prevent bacterial growth while wicking away moisture. When you are comfortably wearing a StomaCloak, you can be confident that your skin will stay healthy! Moisture around or on your plastic ostomy pouch can create a number of problems. Moisture can loosen the glue of adhesive materials holding the bag to your abdomen. StomaCloak wicks away moisture allowing your equipment to stay in place! Created to fit perfectly with active lifestyles, you can swim, run, and shower with confidence. Simply pat your ostomy pouch dry, slip your Stoma Cloak on, and go! Your skin and clothes will remain dry. Any ostomy patient knows the crunchy sounds that the plastic pouch can make. StomaCloak muffles the sound with its smooth, comfortable fabric, allowing you to be comfortable and confident in your life! Crystal introduced herself to the group and we went around the room. Each person explaining their reason for being there and a little history of their ostomy journey. Each story is interesting, and we learn from one another. We welcomed Kathy and her husband John to the group. Kathy is soon to have surgery and had a few questions. We answered I think most of them and provided some ideas for what lies ahead. We also welcomed Brittany, WOCN. Brittany is giving some thought to starting an Ostomy Support Group in Dublin and wanted to see what we do. She is working on getting her Master’s Degree in Nursing at San Jose State. She also brought with her, boxes of Ostomy Supplies that we will give to Cindy. Thank you, Brittany! We also found out the Reyhaneh is going to Oregon to Pharmacology School. We wish her nothing but the best. She did tell me to keep her on the email distribution list as she wants to know what is going on! Linda spent the afternoon baking for our enjoyment. Then several times during the meeting she brought some of her cookies on a plate for everyone’s enjoyment, thank you Linda! June 12 – Ms. Toni Daniels, from Coloplast will be joining us. August 14 – Joe Vega – Cancer Survivor, Double Ostomate, Positive Mindset Coach and Inspirational Speaker. October 9 – Bag Change Extravaganza, this will be the fourth year we have done this. We would like to have three people volunteer to change their device at the meeting. This has become a popular event as we all learn from it. Please give this some thought! Speaking of fun. Several people have asked that we have a “Social Night” at a local adult beverage facility. So, the question to the group, how many people would like to participate in this? Please give it some thought and let us know at the June meeting. Our next meeting is June 12, 2018 in the Rosalie Rendu Room, starting at 7:00 pm. This is a picture of some “Ostomy Bears” the group donated for kids at Stanford. Note that each bear has a Stoma. 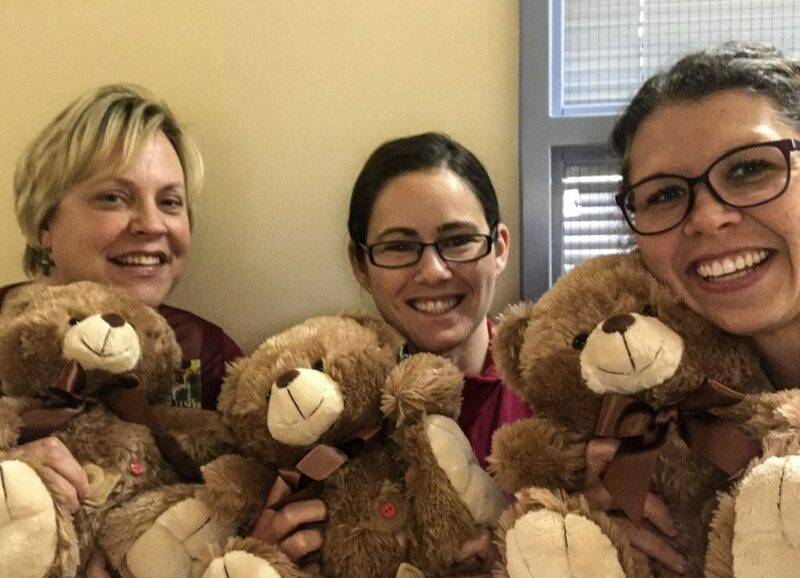 With our donations they were able to buy 20 Ostomy bears to comfort young new ostomates at Lucille Packard Children’s Hospital Stanford. The April meeting was called by to order at 7:00 pm in the Rosalie Rendu Room by Dave. 29 people were in attendance for the meeting. Jennifer introduced Ms. Bamboo Ilana, L.Ac, Licensed Acupuncturist, Movement Specialist, bamboo.ilana53@gmail.com, www.fasciatouch.com, 408-655-5767. Bamboo consistently helps clients who have not found relief with other treatments. Her clients often experience significant relief and increased mobility after a single session and have continued improvement with additional treatment. If you’ve tried conventional methods and have not found relief, it is time to call Bamboo. There is no reason to live in pain! Bamboo is a licensed Acupuncturist and a Movement Specialist. She combines several modalities to help her clients get out of pain and move with greater freedom and ease. Bamboo spoke about how scars can affect the entire body. Scars are interconnected throughout the body and can affect quality of life issues. She told us about Myofascial release and how the pain related is simply the tip of the iceberg. After speaking to the group, Bamboo then demonstrated various techniques in dealing with scars and what can be done. She provides Acupuncture~Ch Med, Myofascial Release, Craniosacral Therapy, Self-Myofascial Exercise, Scientific Hand Analysis. Bamboo looks forward to supporting you as you fully step back into your vibrant life. We had several people join us this evening. We welcomed Laura, Shannon, Arthur and Nancy to our meeting. One of our members, who had moved away, came to visit us and we welcomed Sastry who is here on vacation. Very good to see him. Also joining us this evening was Helynn Rueda, CWCMS, Senior Territory Representative from Shield Health Care. If you have questions about medical supplies, please contact her at 510-459-7896 or hrueda@shieldhealthcare.com. You can also look at www.shieldhealthcare.com for information. Helynn told us she is going to try to arrange for Laura Cox, Ostomy Lifestyle Specialist from Shield to visit with us later this year. Laura was with us several years ago and as an Ostomate since 2011, offers a fresh and candid approach on living with an ostomy. Once we have a date, the word will go out. Jennifer then led a discussion group, as questions came up from our members. Linda spent the afternoon baking and she provided baked treats for the group and we thank her for her support. If you can, look at the Silicon Valley Ostomy Support Group, www.SVOSG.org web site. There is a picture of a portion of the Stanford WOC Team with some of the Ostomy Bears that our group bought. These bears will be given to children who have ostomies. Finally, I want to Thank Rev. Paul Masquelier, Jr. for his kind donation and continuing help in maintaining the Silicon Valley Ostomy Support Group Web site. Without his help, this simply could not happen. Our next meeting is slated for May 8. Our June 12th meeting, we will have Toni Daniels from Coloplast joining us to talk about what is new from Coloplast. Our next meeting is May 8, 2018 in the Rosalie Rendu Room, starting at 7:00 pm. The meeting was adjourned at 8:30 pm. The March meeting was called by to order at 7:03 pm in the Rosalie Rendu Room by Jennifer. 27 people were in attendance for the meeting. This evening we welcomed Ms. Carolyn Trapp, Territory Manager, Ostomy Care, San Francisco Bay Area for Convatec. Carolyn talked to us about Convatec, not only the products they have, but a program they are very proud of. Me +, this is the Convatec Services & Care program. This program is designed to assist the new Ostomate through the entire journey, providing the support, insights and the products you need. This is a comprehensive kit and personal support customized to help you get comfortable with your ostomy in the weeks ahead. This starter kit comes in a discreet package that includes pouches and adhesives, plus detailed instructions on how to change your pouch. It also gives you the tools and resources to help you manage your stoma, without changing the way you want to live. But most of all, it gives direct access to compassionate, highly trained specialists when you have questions or need advice. Call at CIC 1-800-422-8811 (M-F, 8:30 AM – 7:00 PM EST or email CIC@convatec.com . Carolyn talked about a program still being developed, called Great Comeback that Convatec is working on. This is an additional Ostomy Support Program. Great Comebacks connects you with people who have been right where you are now. Visit www.convatec.com/ostomy to find out more. We asked Carolyn if we could have a link on our Web Site to the new Convatec “Road to Recovery program.” Once Carolyn clears this with Convatec, we will add it. Ostomysecrets helps you looks great and feel confident – so you can go out and do the things you enjoy. Call Ostomy Secrets at 1-877-613-6246. Your first order will get you 50% off with CODE SECRET50. Carolyn stayed throughout our meeting and we greatly appreciate that. She handed out various Ostomy items, suggesting new techniques as well as learning a couple of things from our group. After Carolyn’s presentation, we tried something different as we had a lot of people. We broke into three groups, Colostomy, Ileostomy and Urostomy. Each group exchanged ideas and offered suggestions to address the trials and tribulations of having an ostomy. We welcomed Golzar, Jim and Dianna to our group. We look forward to seeing you. Dave brought in a tool, called Speedy Sharp. This Carbide Edge tool is great for sharpening scissors, kitchen knives, or virtually anything that needs to be sharpened. Take a look at www.speedysharpinc.com for more information. They were available for $8.00 each. Normally $11.95. Cindy Musumeci, who has graciously offered to be a collection point for excess Ostomy Supplies. Her church has offered to assist those in need of supplies and Cindy is the point person. She can be reached at 408-828-2873. Please do not call late! Our April 10th meeting will be interesting. Do you have any of these chronic problems? Have you been considering surgery and feel uncertain about taking that drastic step? Did your pain seem to come from nowhere? Do you feel your pain has been ignored or dismissed? Do you long to get your life back and do the activities you love? Bamboo consistently helps clients who have not found relief with other treatments. Her clients often experience significant relief and increased mobility after a single session and have continued improvement with additional treatment. If you’ve tried conventional methods and have not found relief, it is time to call Bamboo. There is no reason to live in pain! Bamboo is a licensed Acupuncturist and a Movement Specialist. She combines several modalities to help her clients get out of pain and move with greater freedom and ease. She’ll teach you tools and techniques to reduce pain and get your head and mind pointed in the right direction for healing you and the pain. When you have persistent pain that laughs at your regular exercises, we need to look at the history of trauma, physical injuries, surgeries, scar tissue, and the emotional issues that affect all long-standing pain conditions. Bamboo’s goal is to assist you in reconnecting the joy of physical movement and all of your activities. She’ll be delighted to talk with you. I look forward to supporting you as you fully step back into your vibrant life. Bamboo Ilana, L.Ac., MS, Mvt Spec., Rev. After the General Meeting, the officers met to discuss several issues. The need to have a phone. A decision was made to buy a cheap “Flip Phone” that will allow Crystal to get messages and get back to someone with answers. The phone number will be posted on our Web Site and the Phoenix Magazine. Jennifer will find/buy the phone, Annette will make the update to Phoenix. Crystal was contacted by Stanford Children’s Hospital to fund Awesome Ostomies. These small teddy bears have a pink ostomy and at a cost of $20.00 each, the Silicon Valley Ostomy Support Group donated $280.00. Our members donated $120.00. Collectively we donated 20 bears to Awesome Ostomies for kids. Our next meeting is April 10, 2018 in the Rosalie Rendu Room, starting at 7:00 pm. The February meeting was called by to order at 7:00 pm in the Rosalie Rendu Room by Crystal. 17 people were in attendance for the meeting. We went around the room introducing ourselves and giving a brief history of what we were faced with. This evening, John Roberts from Hollister joined us. John provided a history of Hollister, which has been around 95 years. Hollister started out as a printing company and because of people having Ostomy issues, they began to develop Ostomy products. Currently Hollister has 700 products and is an employee owned company. Hollister information: www.hollister.com, 1-800-323-4060 or 1-888-808-7456. John can be reached at John.Roberts@Hollister.com. John passed around numerous products, answered questions and passed out forms to anyone that had questions or wanted to try a new product. We invited John to join us for our October “Bag Change Extravaganza”. Eddie and his wife Cindy were with us. Eddie had Colostomy surgery in the last month and is looking good! We passed around the hat to collect money for Linda as she is now working hard in the kitchen to provide us goodies to snack on during the meeting. Since this was our second meeting of 2018, we began the collection of dues for the Silicon Valley Ostomy Support Group. The annual dues are $20.00. This amount covers insurance, phone and other miscellaneous items that come up during the year. As this is our group, your help is greatly appreciated. If it is a help, you can mail your check to our Treasurer, Annette Kaiser, address is 183 Shelley Ave., Campbell, California 95008. Thank you for your support. The Anesthesia and Informatics Media Lab at Stanford is testing a new device for ostomy patients- the Ostom-i™ Alert Sensor. For more information you can visit https://aim.stanford.edu/ostomy/ or email Sylvie Dobrota. Cindy has a great plan. Her church group has undertaken helping people that need Ostomy supplies. Cindy will pick up excess supplies and distribute them to people in our area that have a critical need. So, saying that, any excess supplies you might have, we now have a way to get them to local people in need. If you have any suggestions for a speaker at one of our meetings, please let Jennifer or Crystal know and they can be scheduled. Remember, the success of our meetings is the result of all of our efforts, not just one person! Please help! The March meeting, we plan to have Carolyn Trapp from Convatec joining us. She is hoping to bring Cindy with her, a WOCN Nurse. Our next meeting is March 13, 2018 in the Rosalie Rendu Room, starting at 7:00 pm. The meeting was adjourned at 8:30 pm. The January meeting was called to order at 7:04 pm in the Rosalie Rendu Room by Crystal. 14 people were in attendance for the meeting. We went around the room introducing ourselves and giving a brief history of what we were faced with. We welcomed two new members to our group. Eddie, accompanied by his wife Cindy and Jeremy. Eddie is scheduled for a Colostomy January 12 and Jeremy has an Ileostomy, procedure was done in 2017.
exercise, Ellen conducted short sessions with several of our members as the meeting went on. If you are interested in exploring what Reiki offers, please contact Ellen at Ellen@LifeInsights.net for further information. She also told us about a program called Leap. Leap provides participants with a support system that elevates and stabilizes their energy flow in the face of all of life’s circumstances. For more information, contact Susan at susanayers@aol.com. miscellaneous items that come up during the year. As this is our group, your help is greatly appreciated. If it is a help, you can mail your check to our Treasurer, Annette Kaiser, address is 183 Shelley Ave., Campbell, California 95008. Thank you for your support. The Anesthesia and Informatics Media Lab at Stanford is testing a new device for ostomy patients- the Ostom-i™ Alert Sensor. For more information you can visit https://aim.stanford.edu/ostomy/ or email Sylvie Dobrota at sylvied@stanford.edu. If you have any suggestions for a speaker at one of our meetings, please let Jennifer or Crystal know and they can be scheduled. Remember, the success of our meetings is the result of all of our efforts, not just one person! Please help! Our next meeting is February 13, 2018 in the Rosalie Rendu Room, starting at 7:00 pm. Our Next Meeting- We meet the second Tuesday of each month, 7:00 – 8:30 p.m. O’Connor Hospital, 2105 Forest Avenue, San José, California. We normally meet in the Rosalie Rendu Room in the cafeteria at the Hospital. All materials contained within these web pages are presented expressly for informational purposes only. In no way are any of the materials presented here meant to be a substitute for professional medical care or attention by a qualified practitioner, nor should they be construed as such. ALWAYS check with your doctor if you have any questions or concerns about your condition, or before starting a new program of treatment. The operators of this web site are not responsible or liable, directly or indirectly, for ANY form of damages whatsoever resulting from the use (or misuse) of information contained in or implied by these documents.